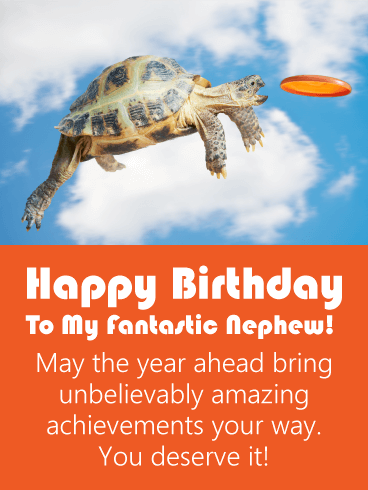 This fun birthday card will give your fantastic nephew a little laugh and let him know that you wish him a year of amazing achievements! It features a turtle doing the impossible, nothing is stopping this little guy! It will remind your nephew that he can do anything, and that is a great way to start off a birthday! So send this inspirational turtle on his way to wish your nephew a happy birthday on his special day. Happy Birthday To My Fantastic Nephew! May the year ahead bring unbelievably amazing achievements your way. You deserve it! 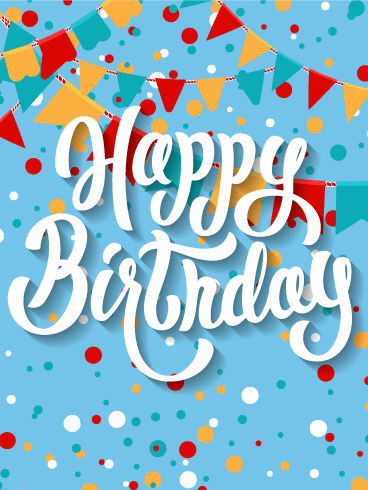 Turn the day from a regular birthday to a wonderful birthday with this card! A wish for every candle means your sending you're nephew a handful of the best gifts. Good health. Happiness. Everlasting love. Success in each of his endeavors. Each wish burns bright with your desire for your nephew to have nothing but the best. Make sure he gets it and send him this powerful card today. Boom! Crash! That's the sound of your nephew breaking all the rules and all the records. He's an explosive young man who will fill the world with incredible things. On his birthday, let him know how proud of him you are. He's an incredible guy and deserves to get an incredible birthday card to match! Send him this stunning birthday card and wish him success at everything he'll try. 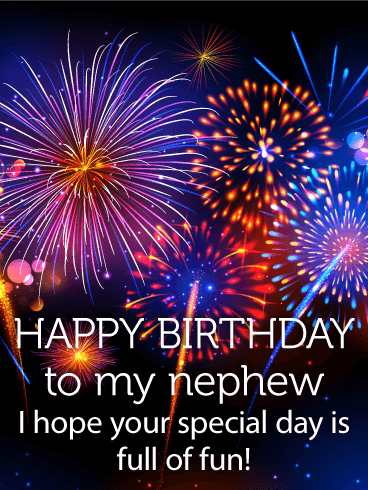 Light up your nephew's birthday with a card full of fireworks. It's sure to go off with a bang! Celebrate your nephew's special day with an awesome birthday greeting card full of energy and bursting with fun. Boys like things that explode and so this birthday card is perfect for a nephew. Send it know and wish him an unforgettable day full of fun. This birthday card is full of surprises! Is your nephew amazing? He deserves an amazing card. Pop the lid of this birthday present and watch the room explode in colorful and sparkling confetti! 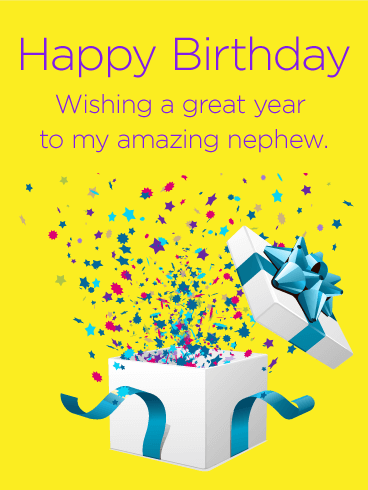 Make your nephew's birthday really burst with fun and joy with this fantastic card. The cheerful yellow brightens any mood and the birthday present has the best gift of all-your warm wishes for an amazing year! Birthdays come but once a year! 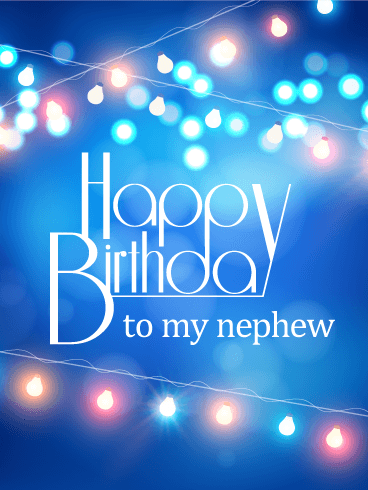 Send a happy birthday card to your nephew and let him know you're thinking of him today. Wish him a great day with this purple birthday card. It has everything you want on a birthday-party hats and presents! 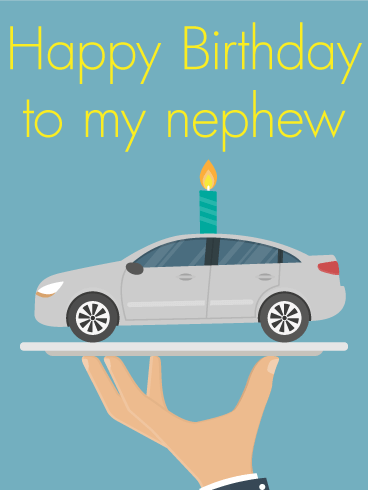 Let the celebration begin when you send this awesome birthday card to your nephew today. Unwrap joy and send smiles. That's what this birthday greeting aims to do! 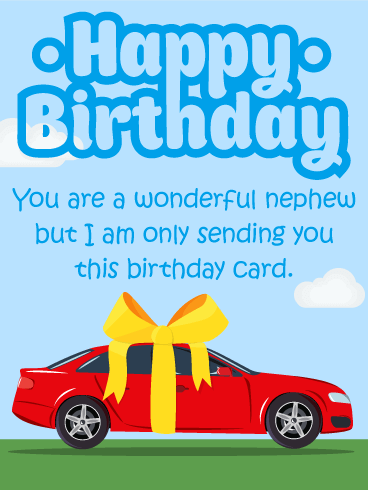 Sure, you'd love to send the red hot-rod convertible to your nephew, but this funny birthday card will have to do! 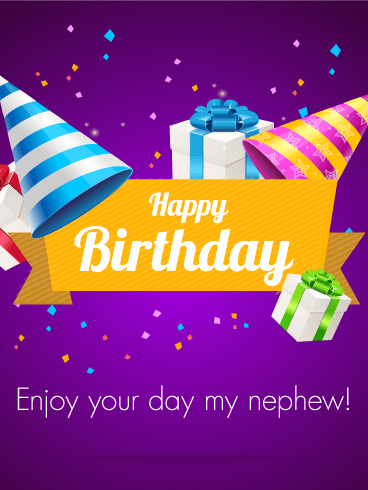 Send your nephew some laughs on his birthday with this humorous birthday message. We wrapped the car up with a gold bow and all you have to do is hit send; your nephew is sure to be pleased. Birthday satisfaction guaranteed. A sleek car served up on a silver platter, thank you very much! We know what nephews love and it's-cars, cars, cars! Skip the cake and send him a Porsche! Light up his birthday with this clever birthday card. This is the perfect birthday greeting for a fun-loving nephew. 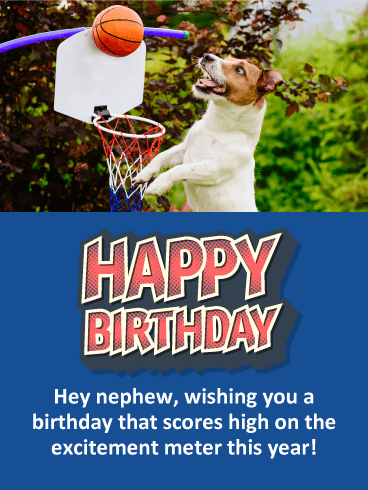 Wish your nephew a happy birthday with sporty birthday card he will remember. Birthdays are for wishes. 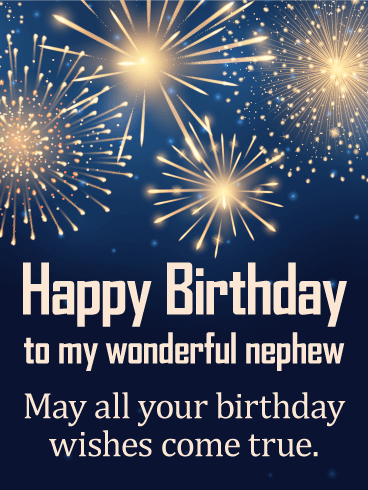 May all your nephew's wishes come true on his birthday. Send him a thoughtful birthday greeting today to inspire his wishes and encourage his dreams. This card is bursting with fireworks and warm wishes; it's great for your adult nephew. Send him this charming birthday card to help him celebrate his special day. Light up the night and light up his birthday with this festive birthday card. Shoot for the stars! Your nephew will love this birthday card that explodes with fireworks. 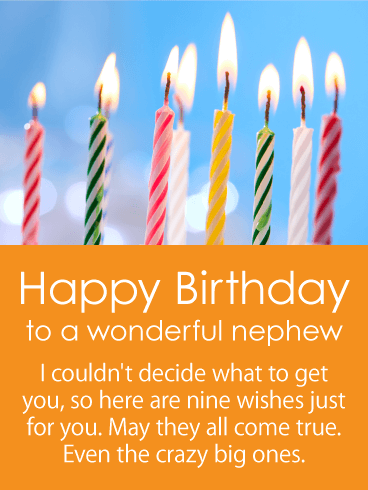 Let your nephew know you think he's wonderful and wish him a great year ahead with this dynamic birthday card. It has a fun 80s kind of vibe to the font and the thickly lined stars. This amazing birthday card will let your nephew know to party on and enjoy every minute of his special day. Break out the party flags. This funky birthday greeting really rocks and will be loved by absolutely anyone. 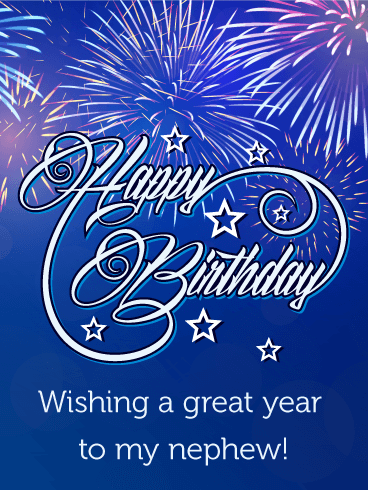 Wish someone a happy birthday with this awesome and simple birthday greeting. We adore the mustard yellow, rust red, and teal color of the flags and dots. It's just plain fun. Be thoughtful and send this spunky birthday card to someone you know ready to celebrate their special day! This birthday card would be great to send to your nephew on his special day. He will love the fact that this little dog is playing basketball. It's very cute and funny! This birthday card will let your nephew know that you wish him a day that scores high on the excitement meter, because after all, everyone should have an exciting birthday! So send this exceptional dog off to add some excitement to your nephew's day! A modern and stylish birthday card for your nephew. 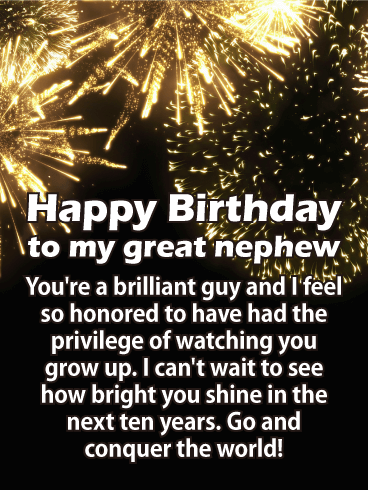 This birthday card boasts party lights and a sleek font to wish your nephew a happy birthday. For a no fuss, no nonsense birthday wish that cuts to the chase and looks good at the same time-this is the perfect birthday card to send. Dust off your dancing shoes and party below the lights. This contemporary birthday card is great for a modern, fashion-forward nephew.